When I started this blog, I planned to discuss only certain topics: video games, RPG’s, boardgames and geeky health. Until now, I was able to restrict myself to these subjects, but recent events have made it impossible for me to hold back my opinion about a topic entirely not related to this blog. However, since I’m the Chindividual and this blog is called The Chindividual, I’m gonna write what the hell I wanna write. Today, that would be about equality. 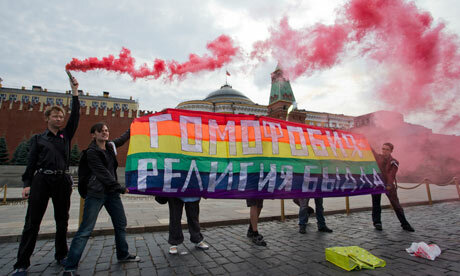 If you haven’t been living under a rock for the past few months, you will be aware of Russia’s anti-homosexual laws. You will also be aware of the fact that Russia will host the 2014 Winter Olympics. Finally, you will also be aware that Russia will enfore its anti-homosexual laws during those Olympics. That’s what’s been going on in a nutshell. Many celebrities have taken a stance of on the subject, with the most powerful and clearly worded opinion coming from writer and actor Stephen Fry. All these high-profile people have said what must be said, so I won’t repeat anything that has already left their mouth or pen. Still, I feel I can add something to the discussion. First of all, let me make clear that I am a firm supporter of LGBT rights. While I do not always agree with their methods of raising awareness (I could devote an entire article to that), I am convinced that no one should be judged because of their attraction to the same gender. I believe that love between two adults is just love, no matter if the relationship coming forth from it is traditional or non-traditional. In the eyes of the law, it should not matter. With that being said, I feel like the enforcement of anti-homosexual laws by the Russian government is not entirely a matter of adhering to religious and traditional convictions. Sure, the Orthodox church has much power in both the government and the general population, and the popular opinion about the LGBT community is not positive, but closer examination shows something else. It shows that the fall of the Berlin Wall did not end the Cold War. It shows that even twenty years after the fall of the Soviet Union, the struggle between West and East continues. In our times it is no longer a war fought through proxies, a conflict about the placement of nuclear warheads on island states. For us, it will be a war about morals, a battle between tradition and social revolution. However, like the Cold War, it will not be fought out in the open between the giants. It will be fought in bloody demonstrations and political talks, but it will still affect the lives of thousands. Putin and his government are using the Olympics to show the West the middle finger once again. It’s a power play they know they can afford. The IOC is too afraid to do anything, and foreign politicians will never talk reason into the power-hungry mind of the autocrat Putin. If the Russian president has shown one thing during his career, it is his fortitude and resilience against the powers of the West. No matter the cost, Putin will enforce his cruel laws during an event that is suppossed to be about equality through sports. The five rings of the Olympics will be stained by the blood of those who dare to love. I know that we simple bloggers can’t do much against it. If powerful politicians can’t stop Putin, we don’t stand a chance. But what we can do is to be open and tolerant, and to show the world how our society embraces the true spirit of the Olympics. I hereby call upon you, dear blogosphere, to remind yourself and the people around you about the fact that there are still people out there who hold on to medieval ideals and backwater morals. This is not just about fighting for the rights of the LGBT community, but also about equality in general. If we want to advance as a global society, we must do everything we can to move past the idea that some are born better than others, bending the power of law to their will. To Lady Justice, the greatest crime should be intolerance, not loving the man or woman of your dreams. We can’t stop the Winter Olympics in Russia, but we can stop inequality in the eyes of the law. The only way to do that, is to stand together. One of the things you realize once you’re an adult is how easy life was when you were a teenager, and how arrogant and stupid you were for wishing to be an adult. One of the greatest perks of my teenage years was all the time I had to play all the video games in the world. I didn’t care much for homework, and I didn’t feel the need to do exceptionally well in school. I did however feel the need to finish the latest Xbox game or help my guild in World of Warcraft. I had my priorities back then, and I thought that in the future, I would still be able to invest the same amount of time into my dear hobby. You see, when you grow up, your priorities change. You see that there are more important things in life than just having fun. You want to invest in a future, no matter if it’s the financial, social or professional part of it. You re-think your decisions, and make sure that the ones you make will count. Before you know it, your childish wants are gone, and you find yourself in a place of your own, with the love of your life on the couch you bought from your own savings. After you pay the rent and bring out the trash, you take a look at yourself and you realize you’ve grown up. That caught you off-guard, didn’t it? Next to this change in priorities and the sudden realization that groceries do cost money, you also find yourself with a lack of time. That’s of course because of these new priorities. You need money, right? Well, that requires a job, and a job devours time. You want to build up a good and strong relationship with your partner? That swallows time as well. A day only has twenty-four hours, and before you know it, you have to get back into bed to be in office on time and awake. At first, you don’t notice it that much, but during one of those rare free Saturday afternoons, you browse through your collection of games and notice that you didn’t finish a single game in the past six months. Come to think of it, you realize that your total gaming time over the last few weeks is not more than about four hours. Where did the raiding nights go? Where did the Sunday morning pre-breakfast gaming sessions go? Who dared to take them away for you? Adulthood did, my friend. Adulthood, the great devourer of your teenage gaming time. Yeah, I’m dramatizing this, especially since I really don’t mind being an adult (with many childish streaks). However, it makes you realize how precious the gaming moments you have are. It’s a hobby I enjoy, and thus I enjoy every minute of it. I want to make the most of the time I have with my games, which explains my gaming / MMO ADD. No matter how old I grow, I can’t see myself without a good RPG on my harddrive and a controller in my shaky, wrinkled hands. Adulthood, eat as much as you want from my gaming time. The one thing you will never consume is my love for the digital arts. When should or shouldn’t you play Guild Wars 2? After lamenting about not finding a new MMO home earlier this week, I decided to give Guild Wars 2 another try. What followed was a quick and awesome ride on my new Charr Elementalist, before I killed my gaming rig during a harmless RAM replacement procedure. Guees it was just my mainboard’s time to go to hardware Valhalla, but fortunately I had some savings in my piggybank to get me a nice little upgrade out of it. So yeah, now I can enjoy Tyria in its (almost) full visual glory! After a few more hours in-game, I started to analyze my gaming experience. That’s nothing special, it’s what we gaming bloggers do. Naturally, I’ve come up with a few things I like about GW2, and a few I don’t. However, instead of just telling you what’s good and what’s bad, I’d rather tell you what kind of gamer you should be if you want to give GW2 a try, and when you should save your cash and spend it on something else. Like, for example, chocolate. I heard that many people enjoy that!